The economy is crazy, and everyone is trying their best to make products “green” for our use. All of us can do our part, even hard drives are now green. Western Digital, a long-time hard drive manufacturer, releases their 1TB Green Caviar drive to the public with the intent of a large capacity drive that focuses on low power consumption. Today, we check it out. Reduced power consumption – WD has reduced power consumption by up to 40 percent compared to standard desktop drives with the combination of WD’s IntelliSeek™, NoTouch™, and IntelliPower™ technologies. Helps enable eco-friendly PCs – WD Caviar Green drives yield an average drive power savings of 4-5 watts over standard desktop drives making it possible for our energy-conscious customers to build systems with higher capacities and the right balance of system performance, ensured reliability, and energy conservation. This power savings equates to reducing CO2 emission by up to 13.8 kilograms per drive per year – the equivalent of taking a car off the road for 3 days each year*. By using environmentally-conscious PCs with our WD Caviar Green drives on board, large organizations with many desktop computers can minimize their carbon footprint and save real money on electricity costs. *Assumes that a car produces 1.60 CO2 pounds per Kwatt/hours/year. Calculation of automobile emissions depends on the car’s g/km emission levels and km/year of driving. Cool and quiet – GreenPower™ technology yields lower operating temperatures for increased reliability and low acoustics for ultra-quiet PCs and external drives. 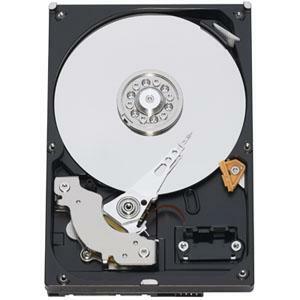 Other information about this hdd can be found on this page. Big and green and not the hulk.